The UTC-USB universal thermocouple connector accepts the signal from any of 9 thermocouple types, and lets you display actual temperature readings on your PC, through a standard USB port. The UTC-USB provides automatic cold junction compensation and linearization; the free software lets you select the thermocouple type and units, and then use your PC as a meter, chart recorder or data logger. 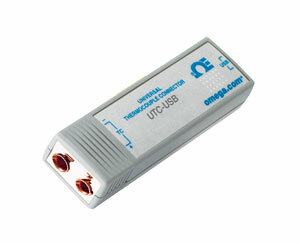 The UTC-USB features Omega’s patented universal input connection, so you can quickly attach both standard and miniature size thermocouple connectors. A standard USB cable is included for fast hook-up to your PC.